ID: This column displays unique serial ID of the language file in the knowledge base. Name: This column displays name of the language file. If the language is assigned to a translator, a name of the translator will also be displayed as shown in the screenshot. Refer Assign Language to Translator for more details. Status: It displays the status of the language file in the knowledge base. Default status corresponding to a language depicts that the front end knowledge base will be displayed in this language by default. You can click on Set Default status available corresponding to any language file to make it default. Direction: This column displays the direction of the text in particular language. You can click on the direction (Left to Right/Right to Left) label to alter the direction. Visible: It depicts whether the language is visible in front-end knowledge base. Yes icon shows the corresponding language is visible and contents like categories, articles of that language can be viewed in the front end. No icon shows that language is not visible in the front end and articles, categories and glossary of that language can be accessed. Edit - In multi-language edition, you can modify the contents of language file either default or self-created. Language file contains all the text used within the front end user interface. 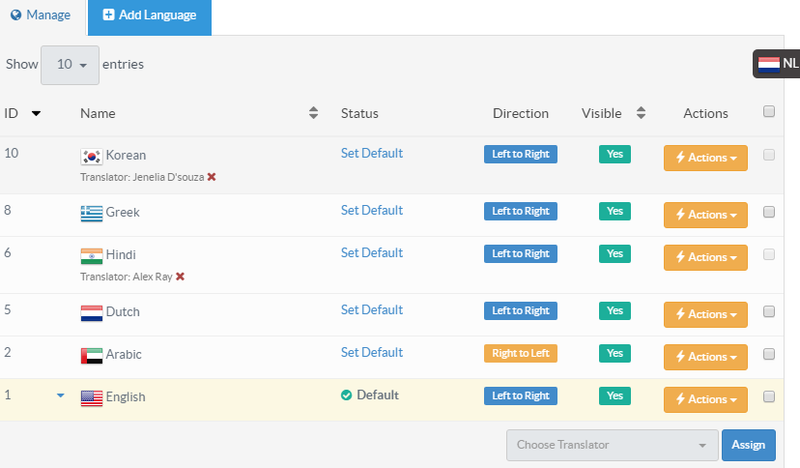 Superusers and translators can translate the pretext for the public section for a language from the admin control panel. Refer Translate Language Files article for more details. Delete - You can permanently remove the language file from the knowledge base. This option is not available for the English language as it is the default language and is required for smooth running of the knowledge base. However, you can disable it if you don’t have any English contents. You can read more about deleting language file in How to Delete a Language File from Knowledge Base? article. Superuser can assign the translation rights of a language file(s) to a translator if needed. For this, check the check boxes corresponds to the language you are going to assign to the translator, select translator name in Choose Translator and click Assign button. Read Assign Language to Translator for more details.